The blog team here at Home Improvement Stack Exchange has endeavored to keep the content flowing with at least one new entry a week. We want to keep you coming back for more and we want to share posts that are interesting and worth reading. Unfortunately, our small contributor pool means that we’re having a hard time getting an entry together each week. The blog can’t continue to publish worthwhile content weekly without new contributors. We need your help! 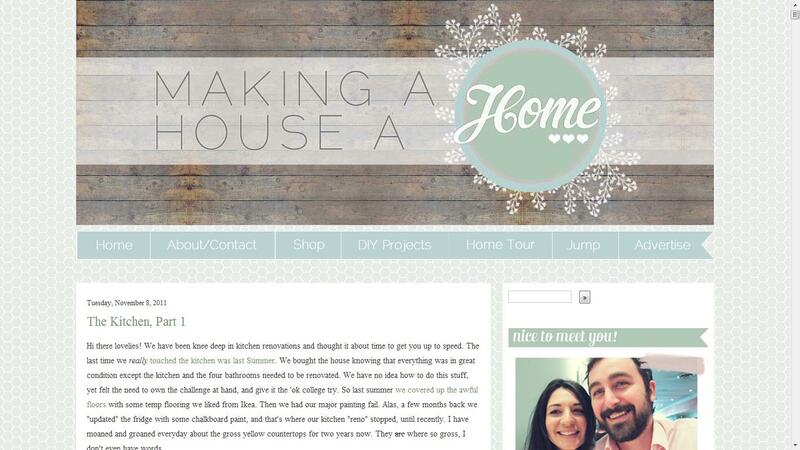 Keep the blog in mind as you gear up for your DIY projects. Take pictures of the work in progress and send them along. If you have old stories to share, new tools to review, or article ideas, please let us know. This is a community run blog, we want to share everyone’s experiences and build a site you want to be part of. Please see this for more info on how to contribute. We’re not closing up shop, there are interesting projects, tools, and ideas in the pipe. Please bear with us as we attempt to unclog the line, and try to get posts flowing. It’s come up in the chat a few times, why are all these programmers and sysadmins avid DIYers? I think it’s partly a natural extension of the tinkering we do on the job and partly our comfort of dealing with huge mistakes that cost a lot of money. Nearly everyone in this field has war stories of downtime on systems that can not go down or impossible bugs that ruin deployments. Big bucks are on the line and you have to come through. In comparison, the prospect of a few holes in the wall and a small flood in the bathroom aren’t that scary. 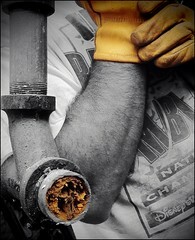 So in that vein, I’m happy to pick up a hammer and drill and set to work destroying improving my home. And things don’t go quite right. This is another feeling I associate with programming for a living: beating my head against the wall trying to figure out why this simple thing isn’t working as designed. That feeling of learning on the job. And while I’m outwardly cussing at myself or others, I’m secretly enjoying myself. I’ve spent most of my life surrounded by marvelously handy people. My dad designed a switch that cut the volume on the stereo and TV speakers when you picked up the phone. Our sliding glass door was remote controlled to let the dog out (this is in the 80s, people). My grandpa owned his own family woodmaking business. My brother is a bathroom remodeler. Despite all this, I managed to absorb perhaps 5% of what they know. After I reached a certain age, I suppose I started asking the right questions. I actually paid attention and started trying to learn how to do certain things. I learned more about construction techniques, and lo and behold, this stuff wasn’t as easy as they made it look. They had to learn on the job. The only difference is when they screwed up they usually had someone nearby to tell them it was wrong, how to make it right, and if it was too far gone and they should just start over. This is clearly where we DIYers can get in over our heads. So I’m glad there’s a resource like Home Improvement Stack Exchange to help me out! There are a lot of small details in construction and finishing that add up. That’s a good chunk of the reason why a DIY project always seems to take so long. I learned a great deal more about framing and drywall while building a closet above my garage. There was one corner in particular where the wall was already framed in by the roof supports for the garage. Not knowing any better, I reused that “wall” when framing and threw some drywall on top. The drywall wasn’t quite flush, but certainly “close enough”. Then I went to mud. And mud. And mud. Three corners on a piece that wasn’t quite right? Oy vey. So I learned the hard way, it’s easier to fix it in framing than it is before drywall. It’s easier to cut the drywall again than fix it with mud. It’s easier to get the mud smooth than cover it with paint. Each shortcut taken early just makes the overall project take longer – at least until you figure out which shortcuts you can use effectively. On the other hand, now that I have that kind of hard-earned experience, I can cover up many of my mistakes hanging drywall. Now I can focus on figuring out when to apply which experience, much like I do on the job. DIY usually forces you to improvise. If you had unlimited time and budget, you might not even do the work yourself. DIYers tend to put some pretty unreasonable constraints on a project, ones that a professional would never agree to. Reusing roller covers, resuing old fasteners, barely having enough material to finish the job, using the wrong tool for the job because it’s handy – all things I’ve found myself doing that I would never agree to if I was being paid to do the job. These improvisations are really at the heart of what makes DIY fun and frustrating, and most importantly, creates funny stories. Pro tip: Always make sure the stretcher is in the middle of the stud! My experience led me to the easy fix: cut it square, toenail in a 2×4, and slap up a new piece of drywall. Look ma, I’m improvising! Whoa! Step away from the jigsaw! What sorts of “fun” things have you learned while doing DIY? Share in the comments! Resuscitating the roof: Providing adequate roof ventilation. Proper ventilation is an important; often overlooked, contributor to roof health. Controlling the temperature of the roof with ventilation will increase the life of roof coverings (e.g. shingles), as well as help prevent roof damaging problems like ice dams. To control the temperature of the roof, ventilation is key. You’ll want outside air to be able to flow along the underside of the roof, and warm moist air to be able to escape from under the roof. “But wait… I want to insulate my roof to keep my heat in” you might say “How can I insulate the roof, and still keep proper air flow?“. Hold on to your britches, we’ll get to that. But first, we have to talk about roof vents. Roof vents come in all shapes and sizes, so it shouldn’t be a problem finding one that looks good on your house. So now we have a way for the hot air to escape from under the roof, but that air has to be replaced by air from somewhere else, right? That’s where Soffit Vents come in. or slits or holes cut into the soffit covers themselves. These allow cooler outside air to flow up under the roof, to replace the warm air that is escaping thought the roof vents. “But I still want insulation in the roof! How can air flow from the soffit vent to the roof vent, if I have insulation?“. Alright, don’t get so excited. This is where baffles come in. Baffles are long U shaped pieces of plastic or foam, that are secured to the underside of the roof decking between the rafters. They allow air to flow freely between the roof and the insulation under the roof, by creating an unrestricted channel under the roof decking. This allows you to install insulation in the roof, while not blocking the flow of air under the roof. Baffles are installed by nailing or stapling them to the underside of the roof decking, between the rafters like this. The baffles can then be covered with the insulation of your choosing. If you are not going to install insulation in the rafters, you may only have to install baffles at the lower end of the roof or not at all. You’ll want to make sure air can get from the soffit vents into the rafter voids, so you may need short baffles to run from the soffit past the insulation in the joists of the attic floor. In this case, the baffles do not have to run the entire length of the rafter void. OK, so now we have cool air flowing into the soffit vent, warm air coming out the roof vents, and an open passage to allow the air to flow from soffit vent to roof vent. “But how does that make the roof healthier?” you might ask. Well, now that you have good ventilation the roof will stay cooler in the summer (hot months). This will help the roof covering last longer, by preventing it from getting as hot as it would without ventilation. In the winter (cold months), ventilation will keep the roof colder helping to prevent problems such as ice dams. Ice dams form when snow melts on a warmer section of roof, the water then flows down the roof until it reaches a colder section of roof (usually above the soffit) where it re-freezes. Eventually the freezing water will create a ridge, which will catch more water, which creates a larger ridge. Until finally, you have a dam of ice that prevents water from draining off the roof. Once this happens, water can backup under the roof covering leading to water infiltration. So, now that you have good roof ventilation. Your roof coverings should last longer, and the house should be slightly cooler in the summer. Ice dams, and dangerous icicles will be less likely to form. And you’ll likely notice savings in your heating and cooling bills, which is always a good thing. I really do love reading blogs. 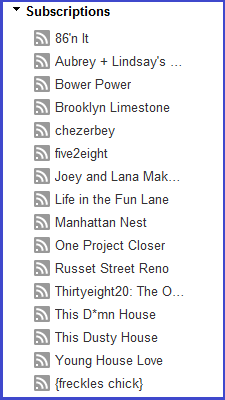 Every morning, first thing after I check my email, I cycle through my blogroll. It’s almost zen; I click through, scroll, open in a new tab to comment or read further, and then on to the next one. I’ll routinely get through 5-6 tabs each day, commenting, reading, linking. I’ve even started sharing posts in our very active DIY Chat when the post is interesting or something that our users could offer insight into. Mostly, though, it’s one of my favorite parts of the day, and I figured I should share my favorites with you all. I should note, of course, that my all time favorite blog is, of course, this one. And I’m not biased at all, haha. 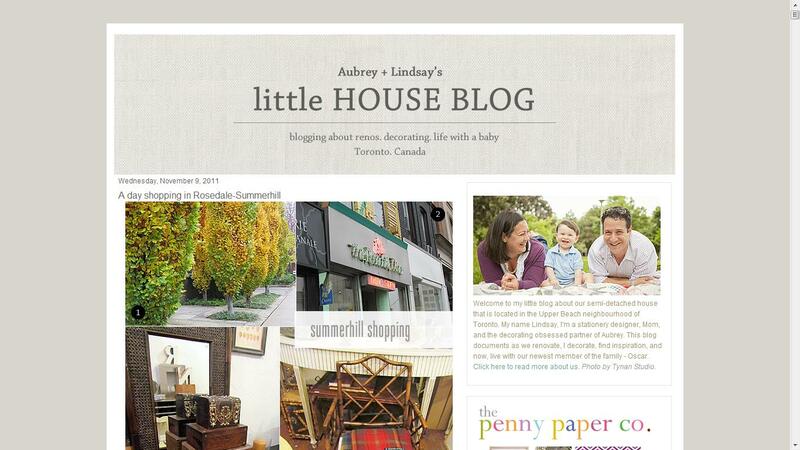 Little House Blog — Aubrey and Lindsay (the latter of whom is the author of the blog itself) are a Canadian couple with a wee one who blog about decorating, craft projects, and DIY work they’ve done around the house. Canada, right now, is something of a hotbed of DIY activity, so searching for Canadian bloggers was pretty important to me. Lindsay’s got a great voice, takes fantastic pictures (seriously, every photo is artful) and her entries are short and sweet. The best combination of things! 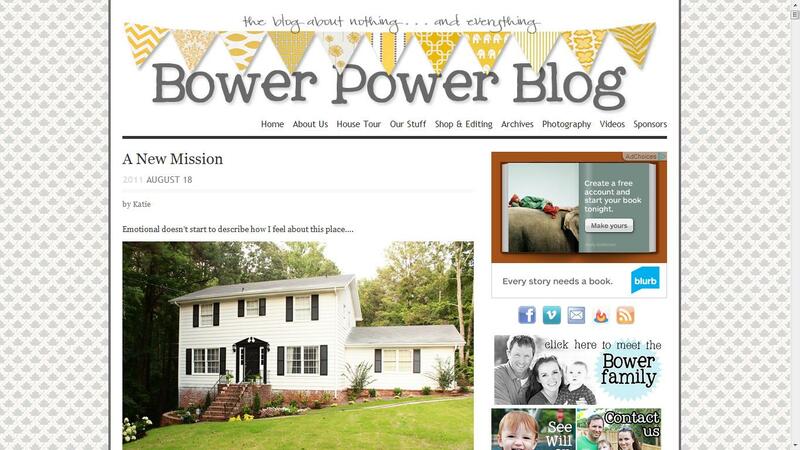 Bower Power — Katie runs a blog that’s as much about what’s happening in her life as it is about her home improvement projects. Whether it’s painting her dining room or antiquing a window, Katie has a great sense of humor, a really casual writing style, and a kind of tongue-in-cheek honesty that makes me laugh as I read her entries. Making a House a Home — Joey and Lana (the latter, again, the main proprietor of the blog) are kind of my heroes. They both work full work-weeks and still manage to find the time to DIY. It’s amazing. I’m constantly in awe. Lately, they’ve been rushing to finish their to-do list so that they can (gasp) move across country! I’m loving their kitchen renovation stories, dining room painting stories, and just….I like them. Lana is particularly active on Twitter, and she’s just such a joy to communicate with. So is Joey, lest I forget him! I love that Lana and Joey are honest when they’ve messed up a project (I believe they had to repaint their kitchen cabinets because they used the wrong kind of paint) and about how difficult or easy a project has been. I also love how much they love their power tools. 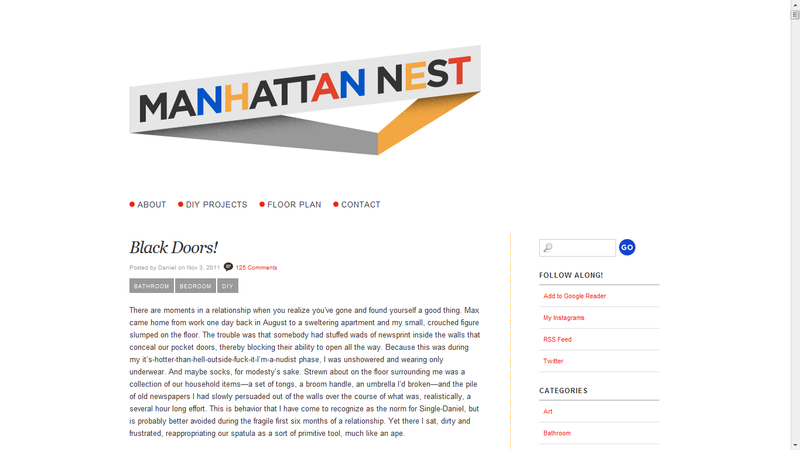 Manhattan Nest — I will totally cop to loving Manhattan Nest. Aside from having one of the coolest blog headers around, Daniel is awesome. I love his voice in his blog posts. Okay, his blog posts are profanity-filled and irreverent, but I love it. He’s also really easy to “listen” to as he builds bookshelves or reorganizes his kitchen or paints all his doors black. I love his blog posts, and he deserves a bit of a bump. Young House Love — John and Sherry are a blogging couple (yes, John blogs too!) who have been blogging for, like four years. They’ve detailed their DIY drama and triumphs and even though I’ve only been following along since August, it feels like far longer than that. I’ve enjoyed watching them do everything from potato stamp the inside of a closet to building in a 13-foot desk. The entries are amazing, with pictures and step-by-step explanations (including products used!) as well as a little silliness along the way. Plus, Sherry will personally reply to comments and tweets, it’s amazing. (This is remarkable because entries can rack up as many as 600 comments for a particularly fun entry.) Plus, John and Sherry have been a joy to work with in the past. Great entries — and frequent ones! 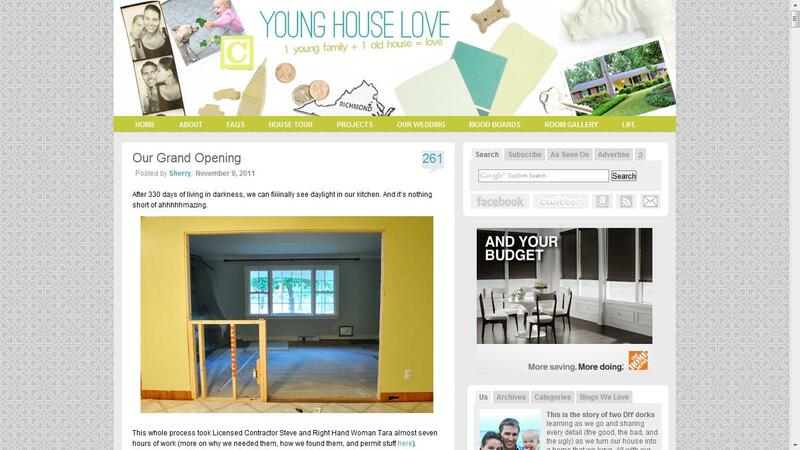 — along with fantastic content makes YHL possibly one of the best DIY/home reno blogs around. So, my top five-but-unordered DIY blogs….that aren’t this one. 😀 I kind of love reading them so much. Some are better at updating than others, but all of them have great content and great people behind them. So grab a cup of coffee/tea/hot chocolate, your screenreader of choice, and settle in for some DIY goodness. Happy readings!